Do you take medications to lower your high blood cholesterol? 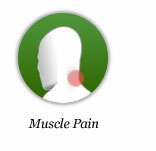 Are you experiencing negative side effects, such as muscle soreness, aches and pains? If you are, Statinzyme's patent-pending formula can help prevent these side effects and provide additional support to your nutrient deprived muscles. 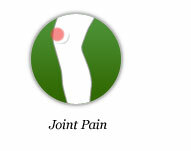 Statin side effects can include joint pain, muscle pain, memory loss and cramping. 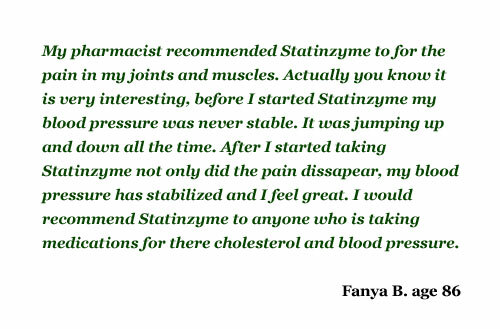 If you want to help relieve and stop muscle pain fast, you can now do so with Statinzyme (The Ultimate Supplement To Your Cholesterol Lowering Medication). 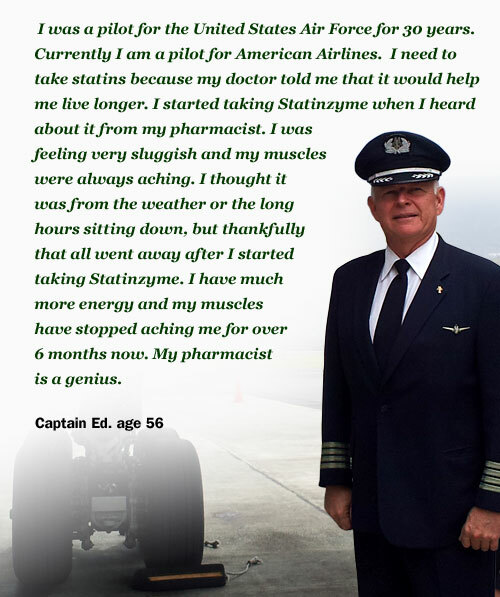 If you want to gain relief from the side effects of Simvastatin, Atorvastatin, Pravastatin and Rosuvastatin then Statinzyme is the answer and the supplemental formula to help stop muscle, joint pain and more! Statins have been shown to reduce levels of CoQ10, and while we want to lower our cholesterol, we don't want to lower our levels of CoQ10! CoQ10 is important for the health and function of our muscles, and low levels of CoQ10 have been shown to cause muscle pain and weakness. Due to Statins (HMG-COA reductase inhibitors) The blood plasma levels of CoQ10 can be reduced to 50-54% of normal levels within 4 weeks of initiation of Statins. After 18 weeks of treatment, Studies show that the levels of CoQ10 can significantly drop over 80%. A major study from the Journal of Clinical Pharmacology showed that CoQ10 supplementation actually reversed the progression of heart failure in patients who were initiated on statins. Additionally studies show that patients who suffer from heart failure are deficient in CoQ10. CoQ10 supplementation has been shown to lead to improvements in ejection fraction, exercise intolerance, energy, stamina, and liver function. 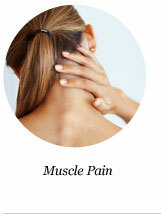 ...low levels of CoQ10 have been shown to cause muscle pain and weakness. 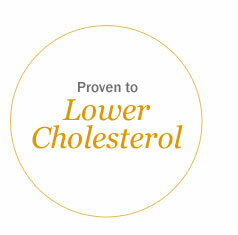 Statins lower your bad cholesterol LDL, but they also lower your good cholesterol HDL. HDL is important for many things. 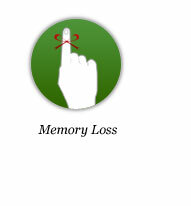 For example, your brain needs HDL, and low HDL in the brain can lead to memory loss and confusion. Fish oil can replenish the HDL that is depleted in patients taking statins which results in an improvement in overall brain function. 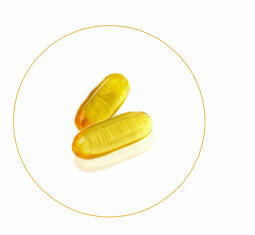 Fish Oil can replenish the HDL that is depleted in patients taking statins. 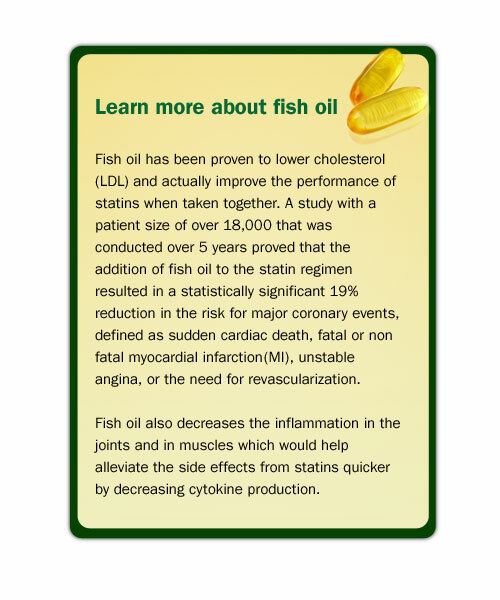 Fish oil has been proven to lower cholesterol (LDL) and actually improve the performance of statins when taken together. A large clinical study (n >18,000) proved that the addition of fish oil to the statin regimen resulted in a statistically significant 19% reduction in the risk for major coronary events, defined as sudden cardiac death, fatal or non fatal myocardial infarction, unstable angina, or the need for revascularization. 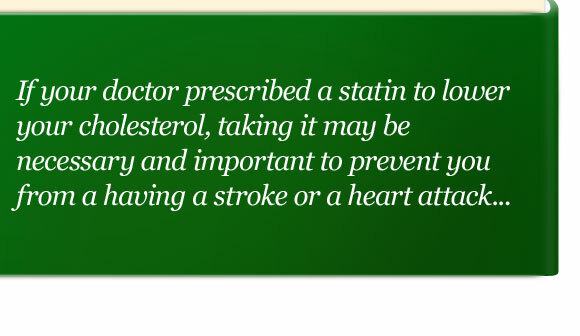 Statins lower your bad cholesterol LDL, but they also lower your good cholesterol HDL. HDL is important for many things. 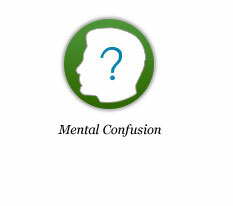 For example your brain needs HDL, and low HDL in the brain can lead to memory loss and confusion. Omega 3, 6 and 9 which are all important components of the HDL that is depleted in patients taking statins. Therefore flax seed oil helps statin patients replenish the full spectrum of HDL. Fish oil only provides Omega 3. 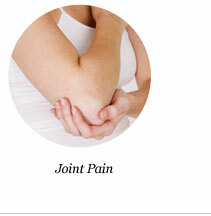 Flax seed oil has been shown to be an anti-inflammatory and may also help relieve joint and muscle pain. Statin use has been shown to lead to decreased production of vitamin D. A study from the American Heart Association showed that patients with low vitamin D levels suffer a 62% increased risk of cardiovascular events (myocardial infarctions and strokes). The vitamin D3 in Statinzyme may reduce cardiovascular risk in patients who are suffering from statin induced vitamin D deficiency. 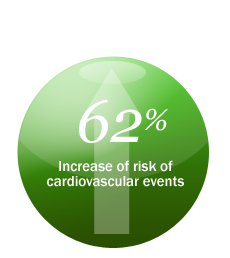 A study from the American Heart Association showed that patients with low vitamin D levels suffer a 62% increased risk of cardiovascular events (myocardial infarctions and strokes). Clinical research has shown peripheral neuropathy (numbness, tingling and pain in the arms and legs and fingers and toes) is more common in people who use statins. Evening Primrose Oil contains CLA (cis-linoleic acid). CLA has been shown to improve statin induced peripheral neuropathies. Statin initiation has been linked to an increase of peripheral neuropathies by over 15%. Resveratrol is a compound which plants release when they are under environmental stress to protect themselves. 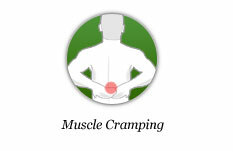 It is found more notably in the skin of red grapes and red wine. 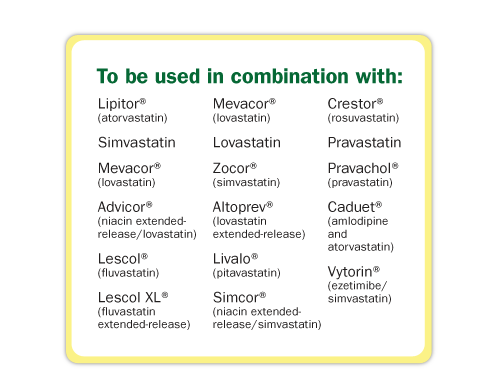 Studies show that concomitant use of statins and resveratrol induces cardioprotection against myocardial infarction. Resveratrol increases neovascularization in the heart which reduces the amount of ventricular reconfiguration or thickening which is seen in heart failure. The combination of B6, B12, & Folic acid is specifically used to reduce levels of Homocysteine which has been linked to increased incidence of thrombosis and cardiovascular disease. Homocysteine degrades and inhibits the formation of the three main structural components of the artery, collagen, elastin and the proteoglycans. 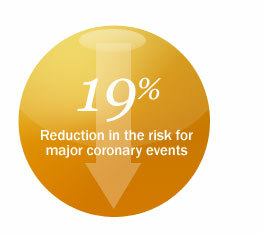 significant 25% reduction in strokes. 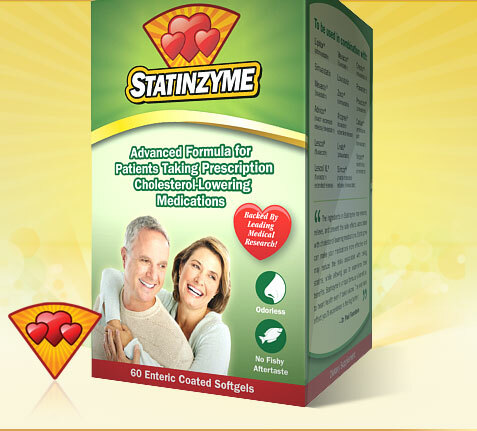 Statinzyme combines 9 unique ingredients in two easy to swallow softgels. 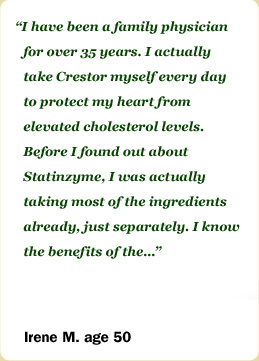 Plus Statinzyme is enteric coated! That means no fishy aftertaste, no upset stomach, and increased absorption. Coenzyme Q10 in cardiovascular disease with emphasis on heart failure and myocardial ischemia. Effects of eicosapentaenoic acid on major coronary events in hypercholesterolaemic patients (JELIS): a randomized open-label, blinded endpoint analysis. Lack Of Vitamin D May Increase Heart Disease Risk. Statin and resveratrol in combination induces cardioprotection against myocardial infarction in hypercholesterolemic rat. Evidence of plasma CoQ10-lowering effect by HMG-CoA reductase inhibitors: a double-blind, placebo-controlled study. Flax Reduces Inflammation Leading to Atherosclerosis. Botanicals and Dietary Supplements in Diabetic Peripheral Neuropathy. 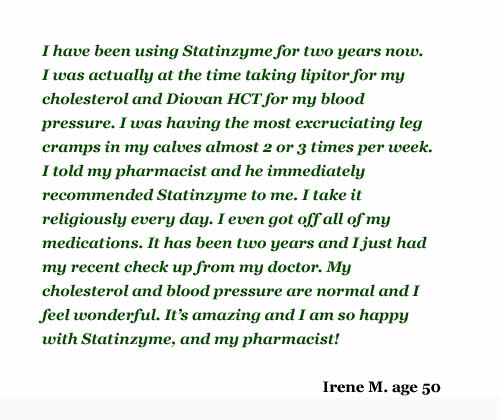 Try Statinzyme for 30 days in combination with your prescription cholesterol-lowering medication and the only side effect you'll feel is feeling better! If you or a loved one are experiencing muscle or joint pain, we guarantee your pain will go away within 2–4 weeks or your money back! To purchase all of these supplements separately would cost well over $100. Statinzyme only costs $39.99 for a one month supply. That's a savings of over $60 per month. 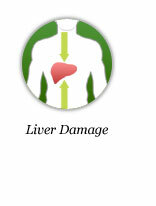 Protect your liver, heart, muscles, and brain with Statinzyme! You get 9 different scientifically proven ingredients all in one serving. You cannot find this combination anywhere else! It is our patented formula. 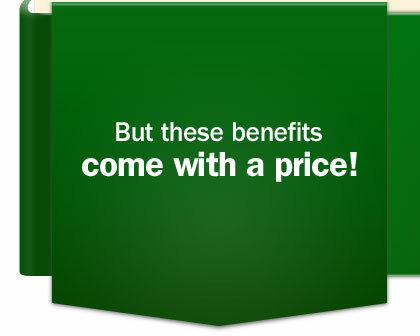 We guarantee your satisfaction or your money back!. In a FDA audited facility (No Citations Ever!) that is compliant with the principles and guidelines of current Good Manufacturing Practices (cGMP). Prior to manufacturing all ingredients are tested for potency and purity in a state-of-the-art lab using the latest high profile liquid chromotography (HPLC) equipment. All manufacturing equipment is tested for bacterial, fungal, and parasite contamination to ensure that Statinzyme meets and exceeds the standards for product quality and integrity set by the Food & Drug Administration. REMEMBER WHEN IT'S STATIN TIME, TAKE STATINZYME! Created by a pharmacist who cares about his patients. Doctor recommended.